Those Vikings - for a brutish bunch they sure seemed to enjoy a comfortable bed. Duvets are a fairly common sight in people’s homes and on your favorite home decorating Instagram feed (dreamcatcher not included), and have even made waves recently with IKEA now selling single duvets for couples in England. For some reason though, the super comfortable European-style double duvets have yet to crack the hotel circuit here in America. Except for, of course, Staypineapple hotels. The decision to break away from American Hoteling tradition was voiced by none other than Staypineapple’s president and owner, Michelle Barnet, who experienced a heavenly double duvet sleep night after night while traveling through Europe. She immediately sent dispatches back to the U.S. imploring her operations team to begin the process of swapping out every bed in every Staypineapple hotel to feature the most comfortable double duvets and duvet covers. They responded in kind, and just as that princess felt that pea, the Staypineapple ops team transitioned the beds. Not a small gesture on its own, the duvet renaissance bloomed into what is now The Naked Experience - a visceral hotel experience that involves everything that touches your body in a Staypineapple hotel. Our goal is to help you feel as uninhibited as you would at home (or possibly more so) through our cloud-like duvets and sheets, plush towels, billowy soft robe - even down to the bathmat. Hotels will continue to evolve, this is known. Whether we’re ahead of the curve when it comes to America’s hotels - time will tell. What we do know is that our guests love them, and we love our guests, so that means we aren’t going to change anything. We’re just going to enjoy the soft, floating ride and you’re invited every step of the way. 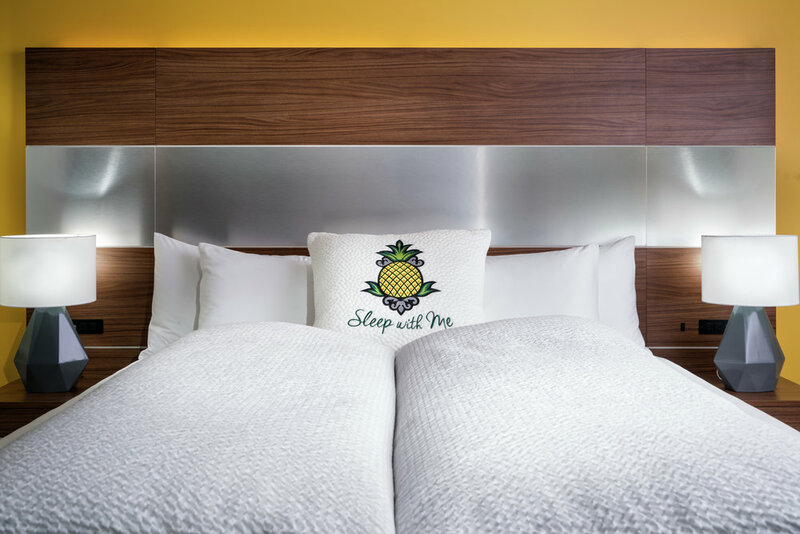 Don’t want to wait until your next night at a Staypineapple hotel to enjoy a European double duvet sleep? You can now enjoy The Naked Experience at home along with other fun Staypineapple items! Check out our online store now!